This NEW 6-Panel/Dip Device is water/urine resistant reducing the chances of an invalid test if the test panels are dipped (in the sample) past the edge of the dipstick card. 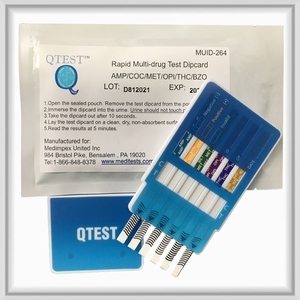 This 6 Panel Drug Test detects the presents of Opiates and their metabolites, but does not detect Oxycodone, Percocet or other synthetic opiates. Please order a test with OXY to detect these dangerous drugs of abuse.